Throughout history, bones have been used in making jewelry. Methods for dyeing bones have evolved over time. While chemical stains or coloring agents will artificially color bones, natural materials such as tea, beets and coffee are also effective. You can make a natural black dye with water, tannins and iron. Darken bone or any natural material to a rich black color by first soaking in a tannic acid solution, then immersing it in an iron salt solution. This will give the bone a permanent dark black pigment. Fill your kitchen sink with water and add 1 tbsp. dish soap. Scrub the bones in the soapy water with a stiff brush to clean them. Cover the bones with 4 cups of 12 percent hydrogen peroxide in a plastic container. Add more hydrogen peroxide if the bones aren't completely covered so that they are thoroughly submerged. Let the bones soak overnight, or until they whiten. Rinse the bones with cold water and let them dry. Small bones will dry overnight, while some larger bones may take a few days. 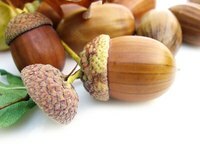 Pound the acorn shells with a hammer on a hard flat surface such as a cement sidewalk to release the nuts. Discard the shells. Pulverize the acorn nuts into a powder by continuing to pound them with the hammer. Place the acorn powder in a small bowl. Add 1 cup of water to the acorn powder and mix well with a spoon to create a tannic solution. Make enough liquid to cover the bones you wish to dye. If you need more liquid, combine 6 powdered acorns and 1/2 cup of water. Place the bones in the tannic solution and soak them overnight. Pour 1 cup of lemon juice into the second bowl. Add one pad of steel wool to the lemon juice to create an iron salt solution. Again, if you need more solution to cover the bones, make more by adding another pad of steel wool for each cup of lemon juice. Remove the bones from the tannic solution with tongs and let them drip for one minute. Place the bones into the iron salt solution and allow them to soak overnight. Put on your rubber gloves and remove the bones from the solution. If your skin comes into contact with the iron salt solution, it will become dyed. Rinse the bones under running water. Lay the blackened bones out and allow them to dry. Why Is Bone China So Expensive? Can I Use Coffee Grounds to Stain Wood?